Travel in style in Dubai with Uber luxury cars. Clean luxury cars take you safely and efficiently (and on time) from A to Z or anywhere in between. Uber is well known in most major cities worldwide, having begun its journey (excuse the pun) in San Francisco, US, in 2009. An extremely user friendly, informative and reliable app which works in real time, simply and effectively. Visitors to Dubai as well as residents can make use of this great little app to use Uber luxury cars. Download it today (wherever you are in the world as it will update automatically through GPS) and keep it handy for the future….even if you are a car owner/driver you just never know when you’ll need their services. The fact that the average Dubai waiting time for an Uber luxury car is 8 minutes is a true godsend if you’re late for a meeting or work which is par for the course here. Even better for the generous westerners amongst us, there is no expectation of a tip by the driver. The Uber app is the ‘go between’ for the licensed car companies and passengers. Uber does not employ any of the drivers or hire any of the cars, they simply provide the back end service, bringing passengers and companies/drivers together at the right time and place. Each driver is registered in the Uber system which means that they are easily identifiable by the client. The driver’s contact number is also made available so there’s no hiding behind the usual excuses of traffic (which by the way has improved tremendously in the past couple of years). You can easily find out the length of time the journey will take and the cost (there’s a great map on their website), taking another problem away from you! When you download the Uber app you will be asked to register details including your credit card details (all kept securely of course). These details are held on Uber’s system so there’s no need to repeat anything. At the end of the journey your credit card is charged and an invoice is sent to the email address registered with Uber. 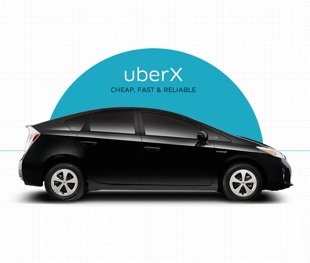 PS They’ve now introduced a new cheaper service – uberX – scroll down their page to see the ‘choices’. Have you used Uber in Dubai? What did you think of the service? We’d love to hear!